Growing up in a small town which is well known for fresh seafood, we eat fish almost everyday! I truly love seafood; from fish to lobsters and my favorite, oysters. Eating fresh, raw oysters make me a very happy person. There was one time I had one and half dozen raw oysters with fresh squeezed lemon juice on it during a buffet dinner at one of the hotels in town. OMG, so succulent! Just thinking about it makes my mouth water. Besides that, like Forrest Gump's friend Bubba, I have always loved shrimp. I guess I would have loved this dish which was created by Chef Mark Holley from Texas. The dish looks impressive and the texture, the beautiful colors makes my mouth water. I am sure by using domestic, sustainable seafood, it is fresh and it has great taste! Well, you can find out the recipes from www.GreatAmericanSeafoodCookOff.com. Look at picture for idea on how to set the presentation of the dish. You also will have your own chance to win a "Trip to New Orleans" prize package including two Southwest Airline roundtrip tickets, hotel accommodations, dining experiences and more by voting for your favorite recipe. How cool is that? 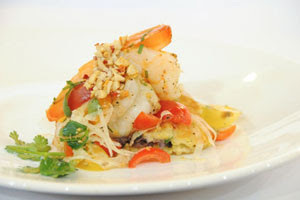 Yes, the Texas Gulf shrimp over hominy cakes with heirloom tomato relish drizzled with prickly pear gastrique is my favorite among the top five recipes. Go check out the top five recipes which you can dish up to your family and bring some New Orleans flavor to your table. Enjoy! Oh, don't forget to enter the contest and vote for your choice and also find out who will be crowned King of American Seafood at the Annual Great American Seafood cook off! Incredible culinary and photography skills! Hi, this is Emily from MarxFoods.com. Would you like to slurp down 4 dozen more raw oysters? MarxFoods.com has two ways to win 48 fresh Puget Sound oysters. All you have to do is leave a comment telling us what you'd do with 48 free oysters. I've linked to the contest through my name. Hi! I'll drop by soon. Thanks.